Synopsis: An emotionally self-destructive boxer’s journey through life, as the violence and temper that leads him to the top in the ring destroys his life outside it. Did You Know? Robert De Niro gained 60 pounds to play the older Jake La Motta at the end of the film. 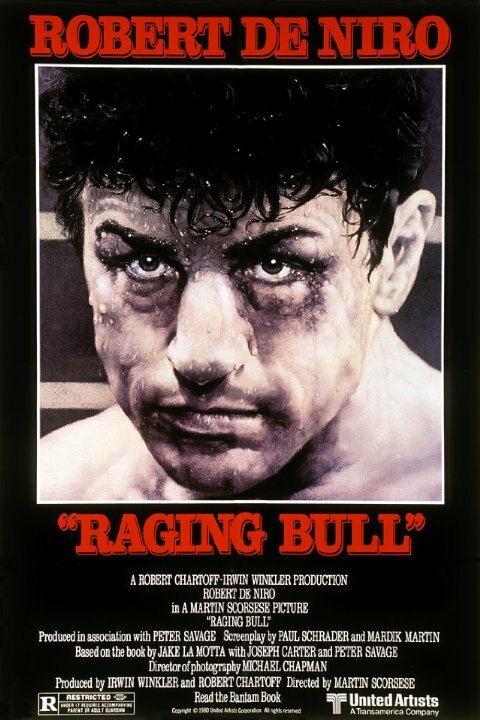 One of the reasons that Scorsese filmed Raging Bull in black-and-white was to distinguish it from Rocky. I think the two are completely distinguishable, though, because the characters are total opposites of each other. La Motta is a horrible person; he’s abusive, possessive, misogynistic, and has an explosive and violent temper. And what’s worse is that he doesn’t become a better person by the end of the film. And I think that this is why this movie is so powerful: it doesn’t glorify the monster (as I feared it would), but there’s a gritty truth to the film that makes it hard to watch nonetheless.